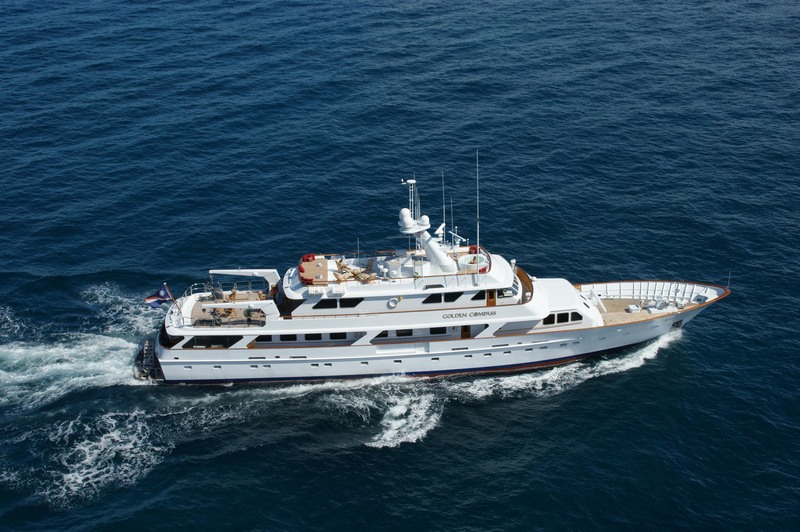 Motor yacht GOLDEMAR is a Picchiotti motor yacht built in 1982 and refitted in 2009. 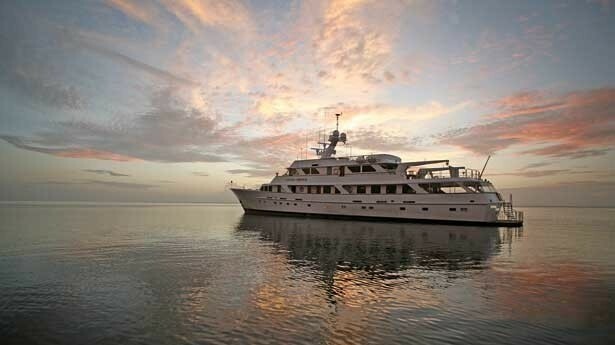 She is luxuriously fitted throughout and is able to accommodate up to 12 guests in 6 spacious cabins. GOLDEMAR's Main Salon boasts a relaxed and elegant atmosphere. 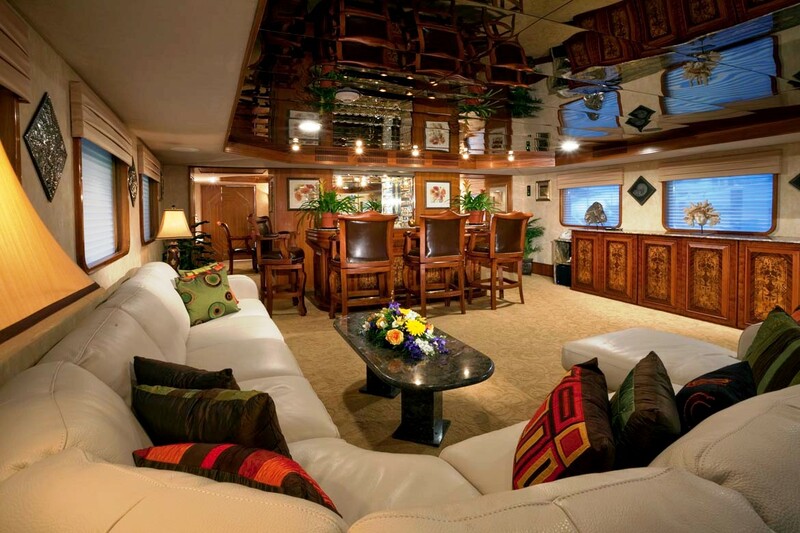 Striking features of the main salon include the ornate Italian marquetry inlay of the large custom bar, entertainment center, game table, coordinating custom granite counter tops, tables, and her compass medallion entry. This is accented with the natural beauty of fossils, butterflies, and coral. The salon also features a large leather U shaped sectional couch, bar and game table seating perfect for relaxing however the 50” pop up plasma TV, Nintendo Wii system, party games, and a state of the art sound system can transform the area into the perfect entertainment area. The adjoining elegant dining salon features a large, custom made wood inlay Italian Marquetry table with 12 chairs and Venetian plaster ceiling. 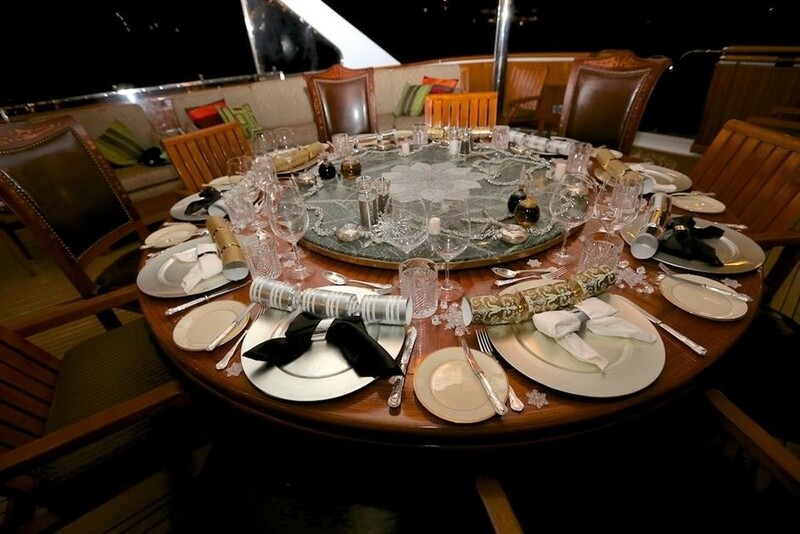 Two large 400 million year old Ammonite (Nautilus) fossils contribute to the Jules Verne ambience that is complimented by a professional sound system and mood lighting. 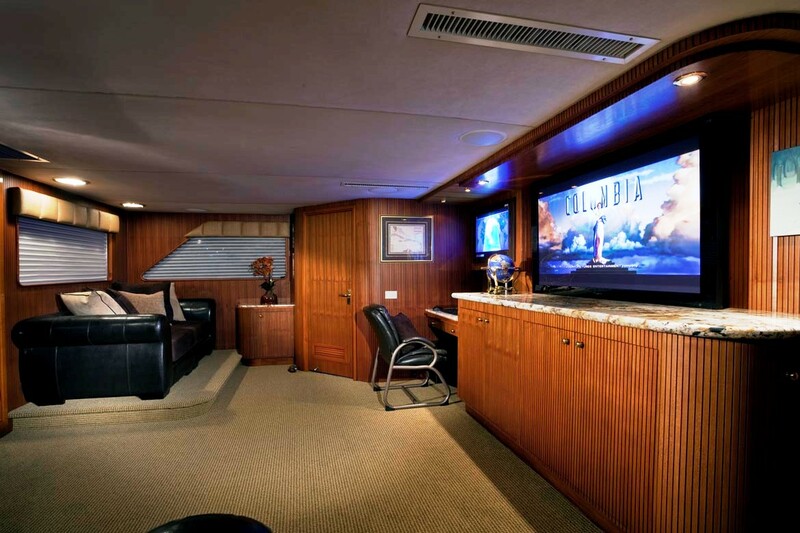 The skylounge on GOLDEMAR is located forward of the Boat Deck, is equipped with two oversized sofas, a 60” plasma TV, professional sound system, Xbox, media computer with access to the ship’s internet, walk up bar, refrigerator, ice maker, and day head. 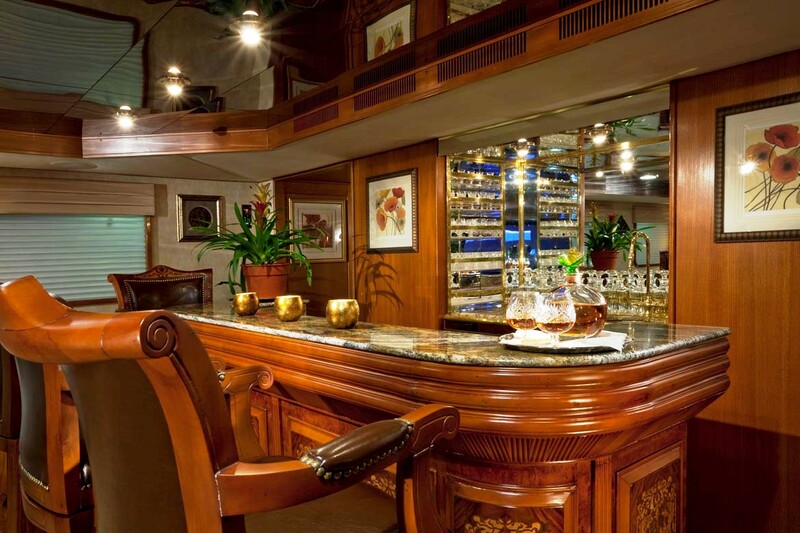 Located just forward of the sky lounge is a 200+ bottle wine storage locker and a large walk-in refrigerator/freezer. 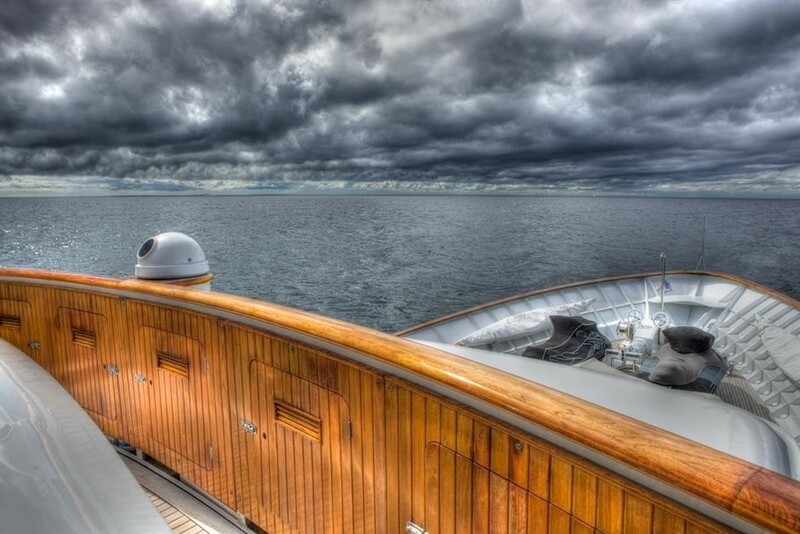 The exterior of GOLDEMAR is equally impressive. 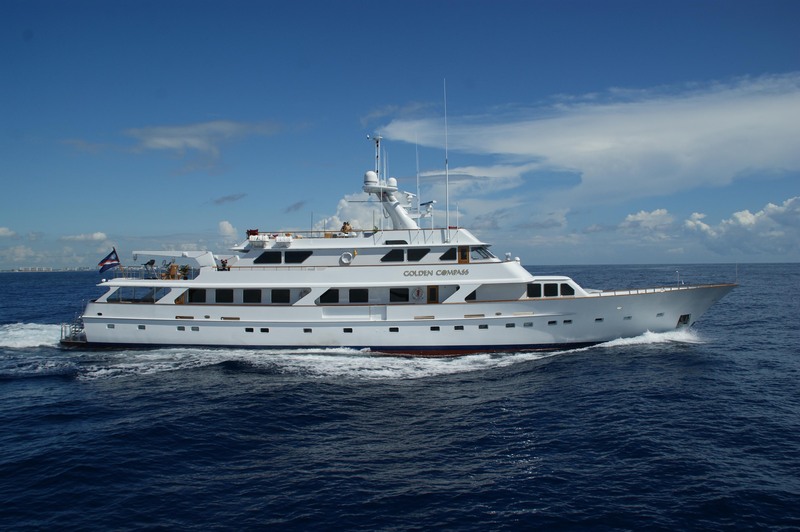 Her large aft deck can be fully enclosed or opened up enabling use in all weather conditions. 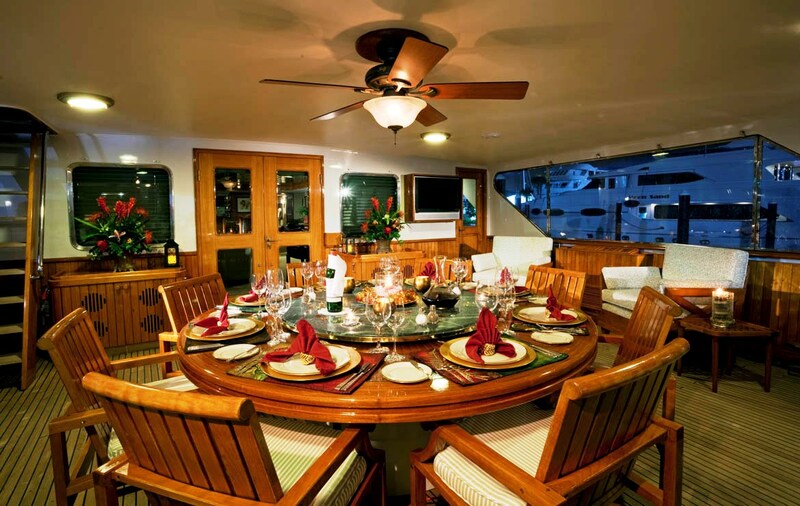 The Aft Deck features a large round teak table with a marble lazy susan, eight upholstered teak dining chairs, four large cocktail arm chairs and a curved couch enabling both dining and cocktail type entertaining. There is a 32” TV and sound system. 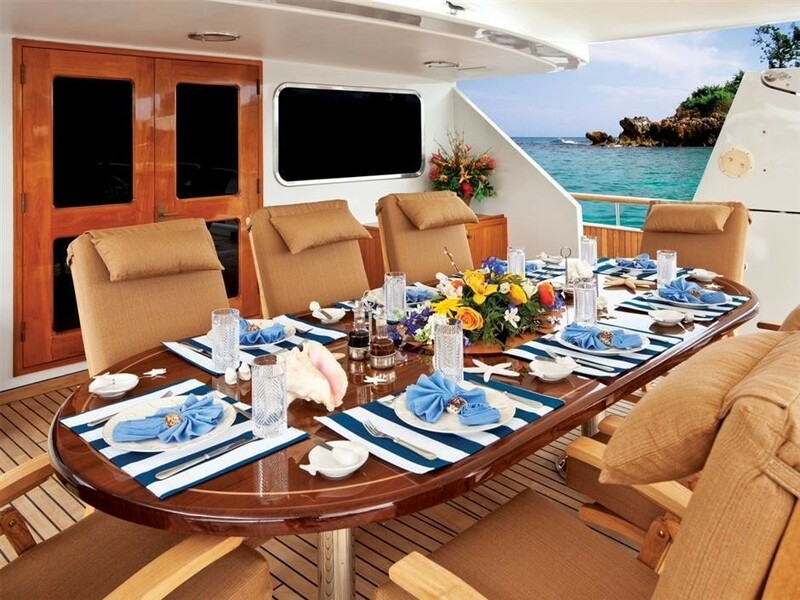 The Boat Deck offers another large entertainment area with its “Golden Compass” lacquered teak oval table able to accommodate 10-12 guests under a removable Bimini top. 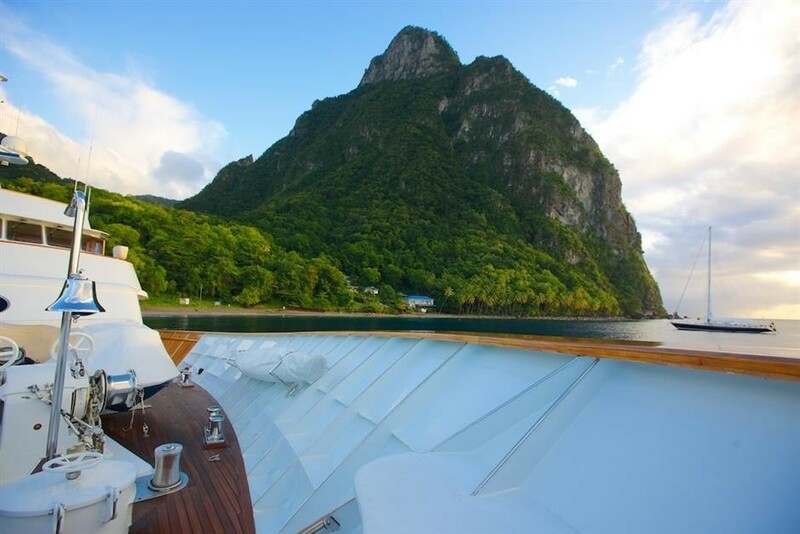 This deck offers ample space to relax in the teak lounge chairs or to get active on the exercise equipment; an Octane Elliptical Trainer and True Fitness Treadmill and is equipped with a professional sound system. 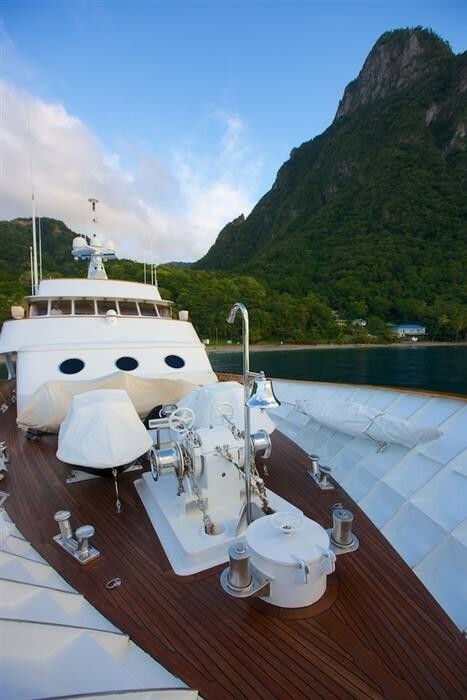 The Boat Deck area aft stores the tender. 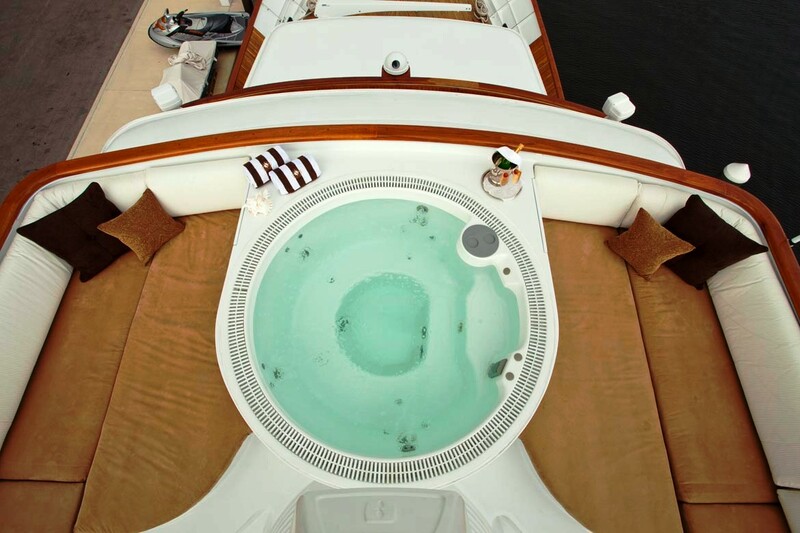 During the day, the large Nautica 19 foot wide body tender can be stored across the aft beam leaving room for lounge chairs and exercise equipment or can be towed. 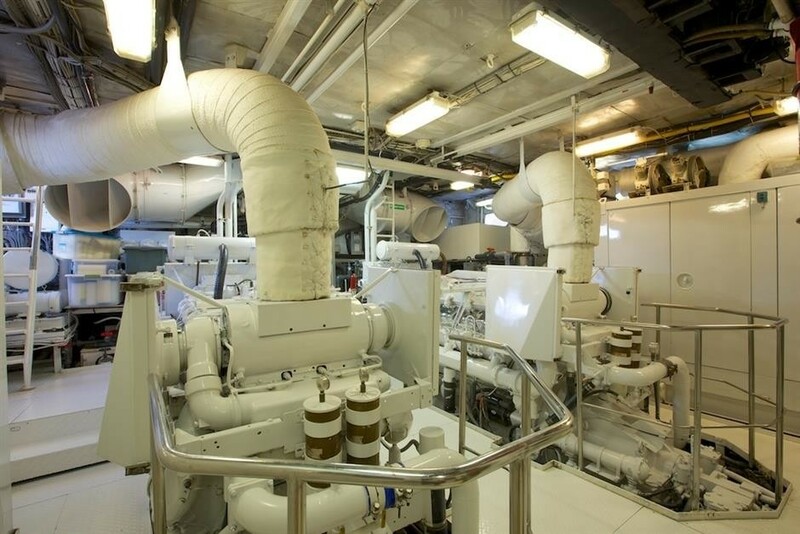 The second crew/supply tender, is stored in the new foredeck along with the jet skis. 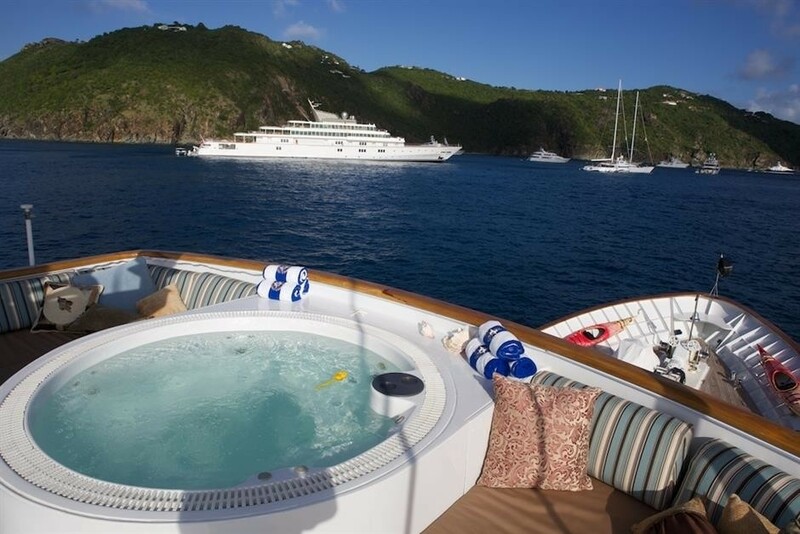 GOLDEMAR has a great range of tenders and toys that are accessible via the large swim platform aft where there is also a shower to rinse off. 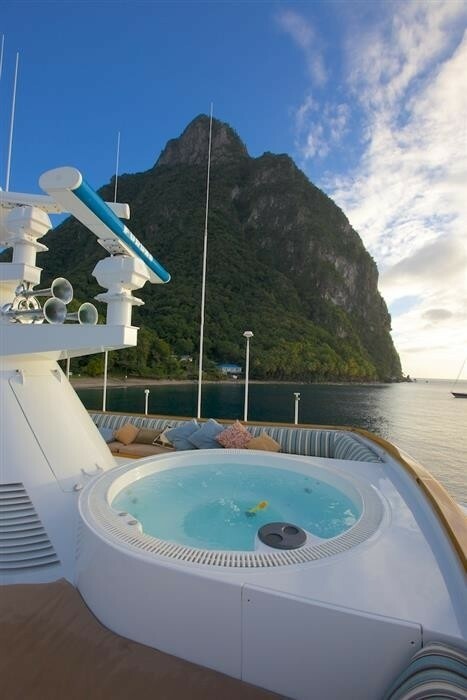 The yacht's spacious Sun Deck is ideal for an intimate evening under the stars as well as a large party. 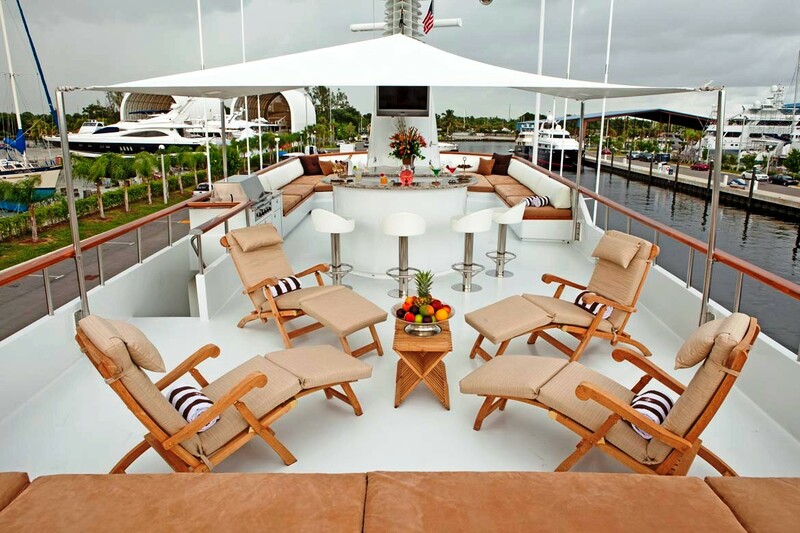 Amenities include a 42” SunBrite flat screen TV, professional sound system, teak lounge chairs and benches with custom upholstery, full beam aft sun pad area (bunny pad) tanning area, Spa Pool, Massage table, Granite wet bar, icemaker, refrigerator, custom bar stools, removable Bimini top for shade, and gas BBQ. 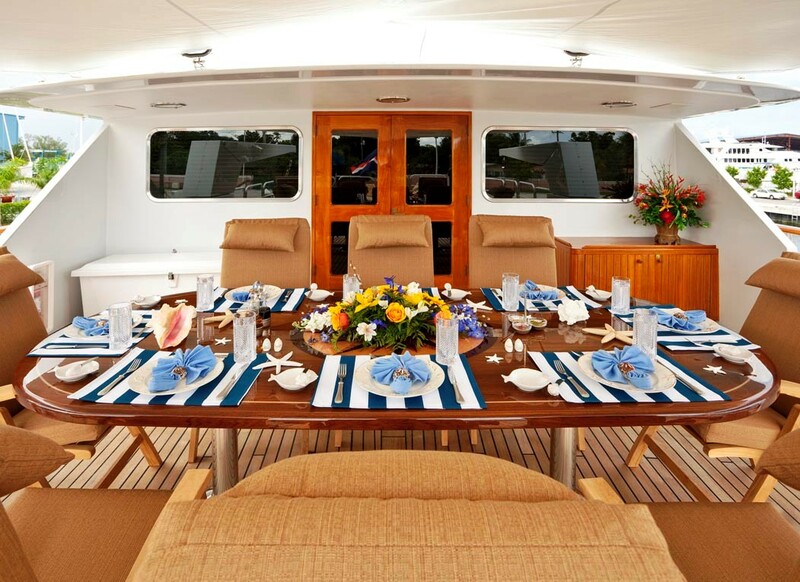 GOLDEMAR is able to accommodate up to 12 guests in comfort and style. 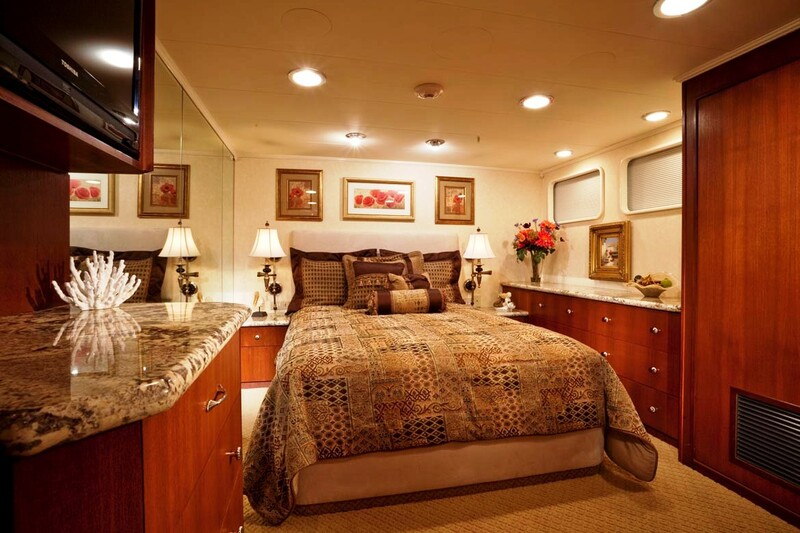 The yacht boasts 6 cabins including a secluded and spacious 600sq foot Master Suite that is accessed by a staircase off the main entry. The Master suite boasts a California king size bed with dual independent controls to raise and lower head/back and feet and a 42” tilt down flat screen TV and professional sound system. 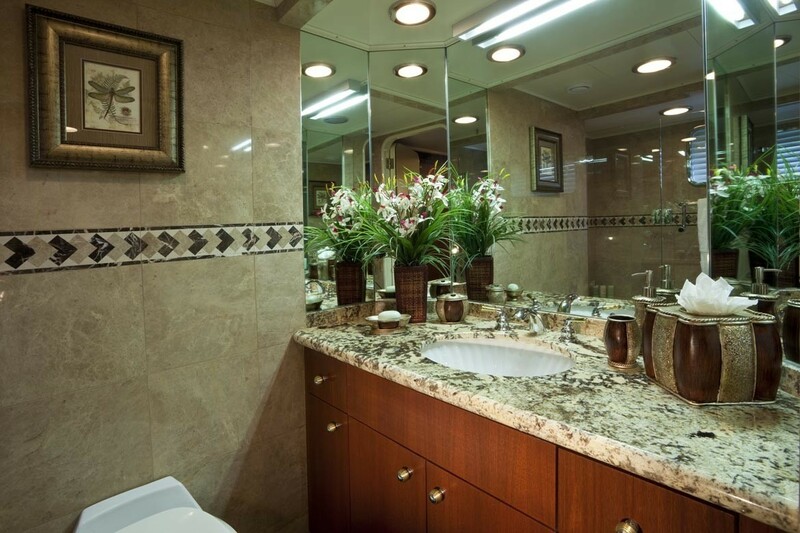 This Suite also features rich green, burgundy, and gold hues of natural onyx marble throughout. 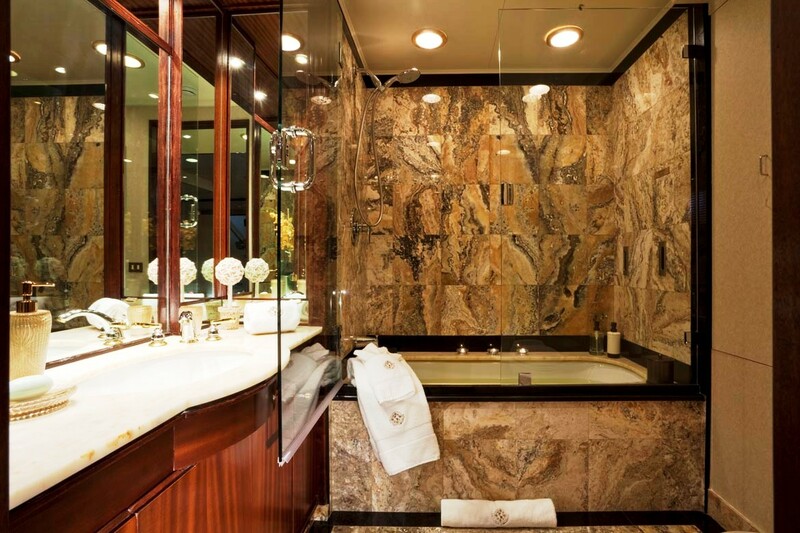 The His and Hers ensuite bathroom is luxurious, his with a shower, and hers with a bath-tub and shower combination. 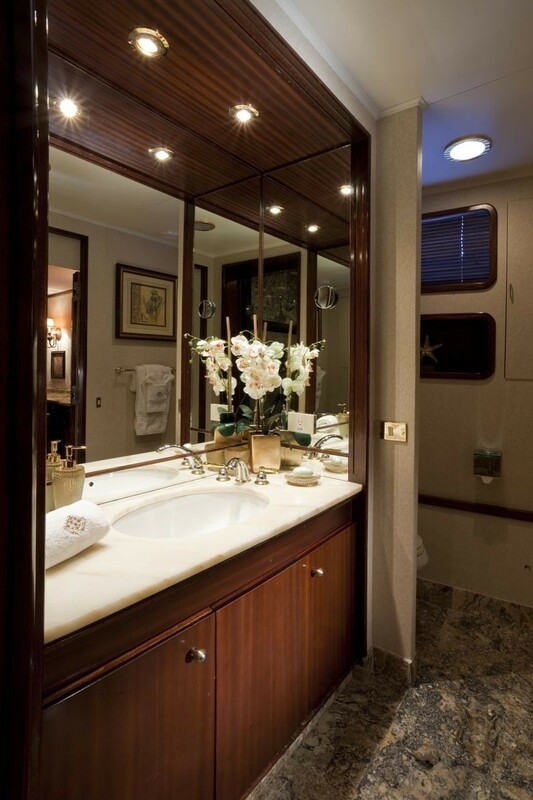 The master cabin has a regal ambience to it with rich hues and coordinating fabrics. 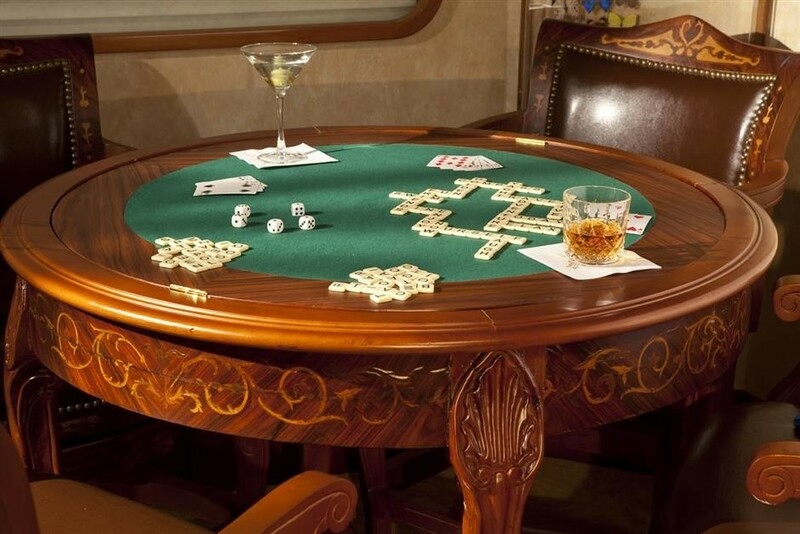 The VIP Cabin is full beam and located on the main deck, forward of the main salon. This VIP suite is spacious with large windows offering plenty of natural light. 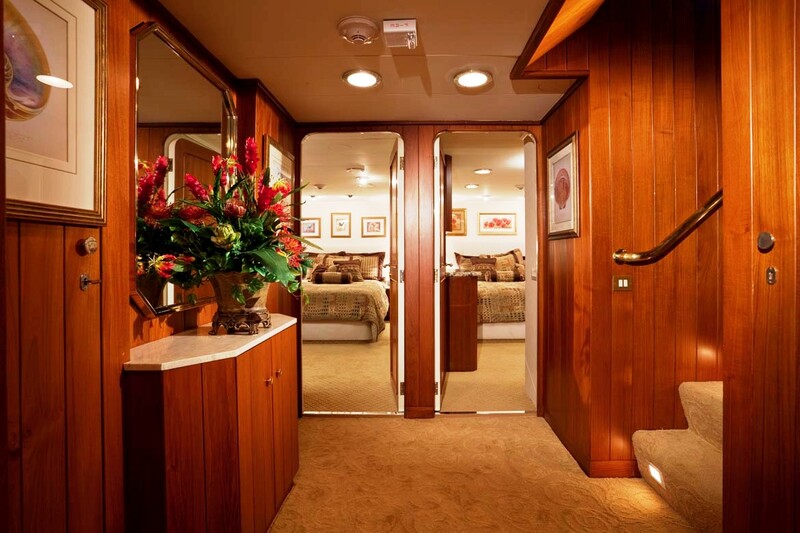 The cabin measures 325 sq ft and features extensive teak woodwork and a lovely Italian inlay Marquetry dresser. 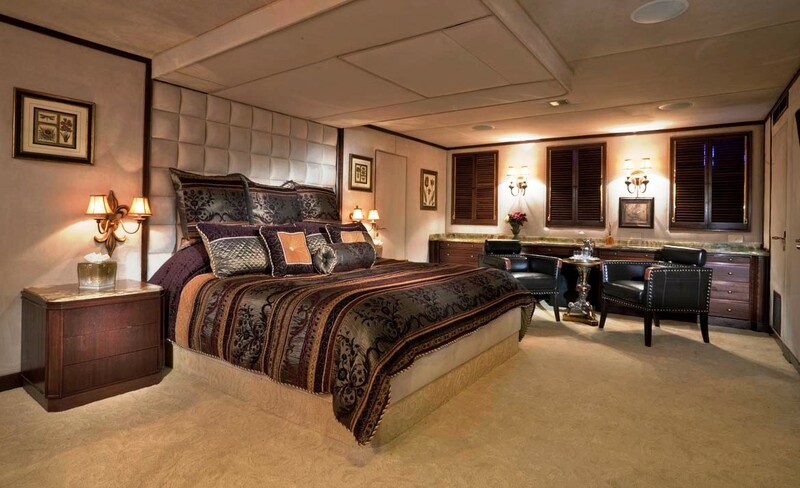 Amenities comprise a California king size bed, leather couch, table, and a 42” flat screen TV with excellent sound system. 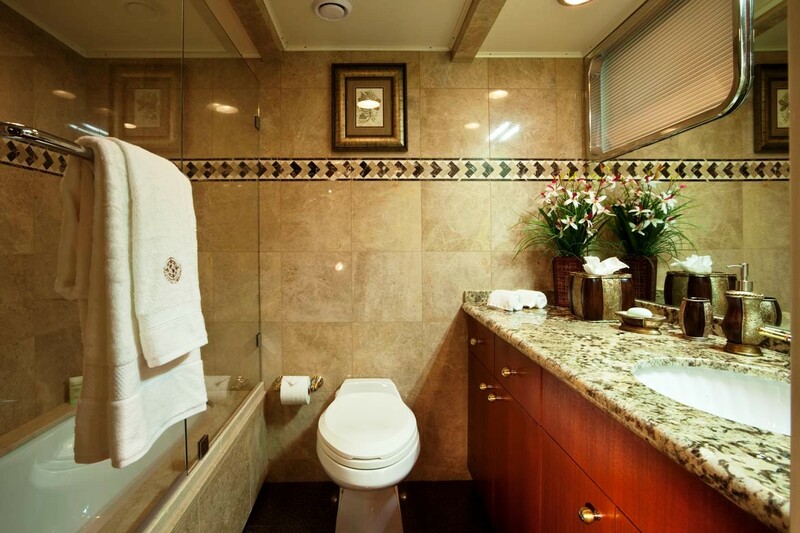 This suite has its own large, private shower and toilet and there is plenty wardrobe and storage space. This cabin offers wheel chair accessibility. 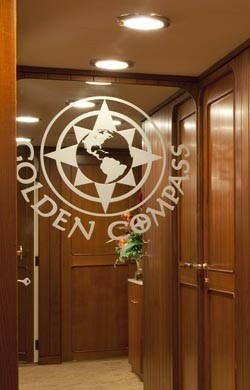 The four guests suites on GOLDEMAR are located on the lower level accessed via the guest foyer. 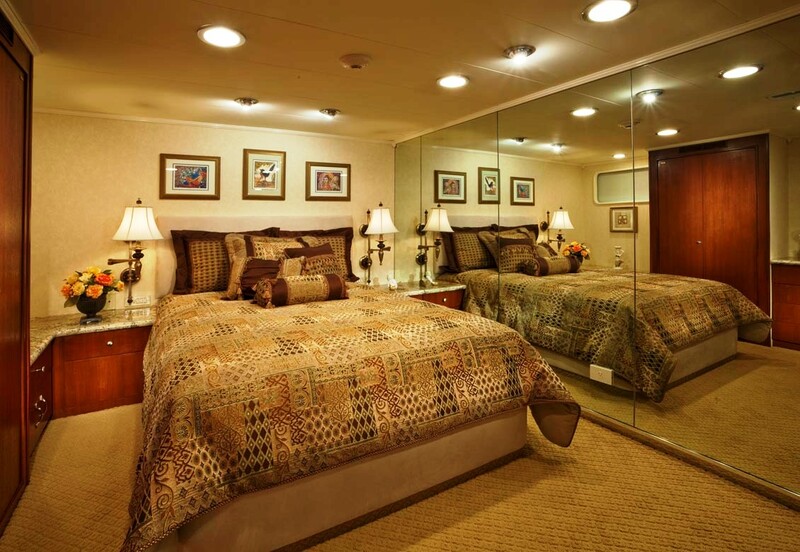 These cabins are also spacious measuring approximately 200 sq ft each. 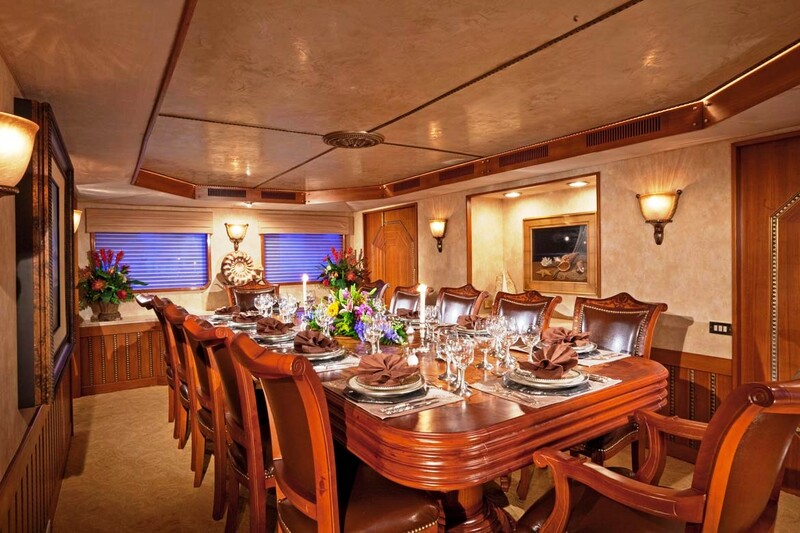 Tasteful décor with custom teak cabinetry and extensive use of marble and granite throughout ensure these cabins are a pleasure to retreat to. 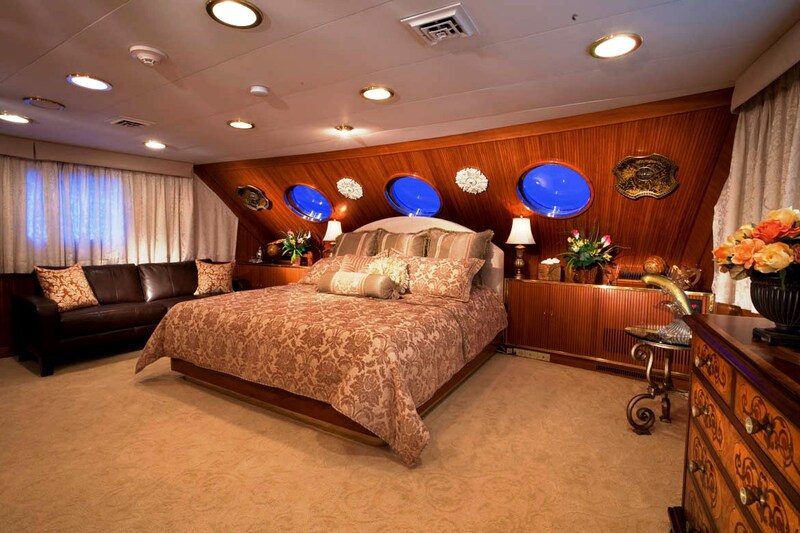 The two aft cabins have a queen bed and the two forward suites have a queen bed and a twin bed. 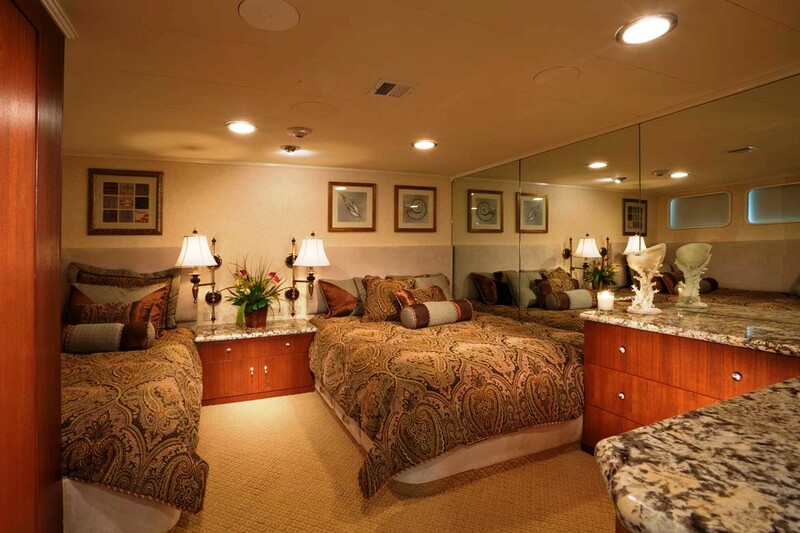 All of the cabins have large flat screen TV’s, iPod docks, and access to the centrally stored movie and music system. 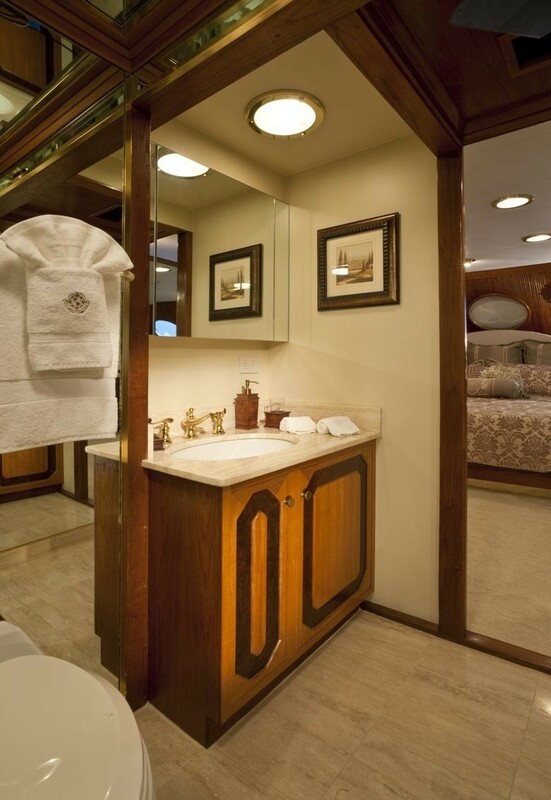 Each cabin has its own private bathroom with tub, shower, toilet and sink as well as ample closet and storage space. 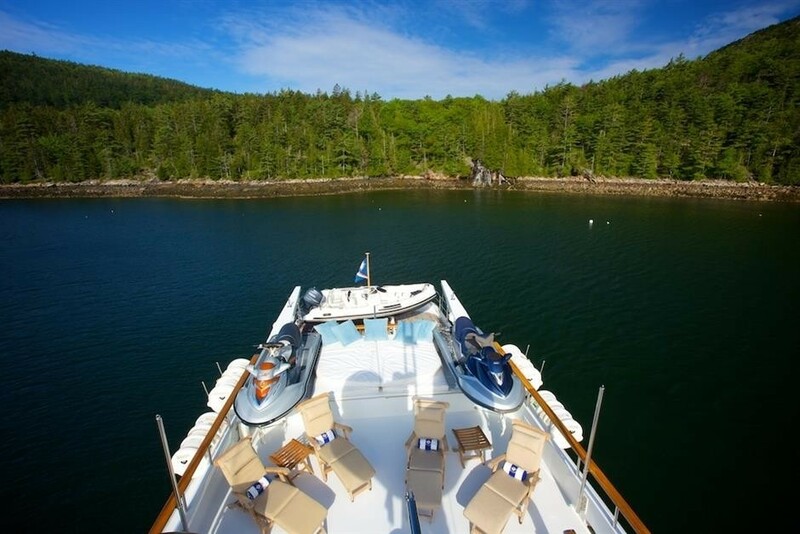 GOLDEMAR has the following extras onboard : Tenders and Toys include a Nautica 19 foot wide body tender and a crew tender, two new full sized jet skis, water skis (both beginner and advanced), wake boards, snorkelling gear (fins, mask, snorkel) for 12, donut, tow- tubes, fishing gear, and newly purchased Kayaks. 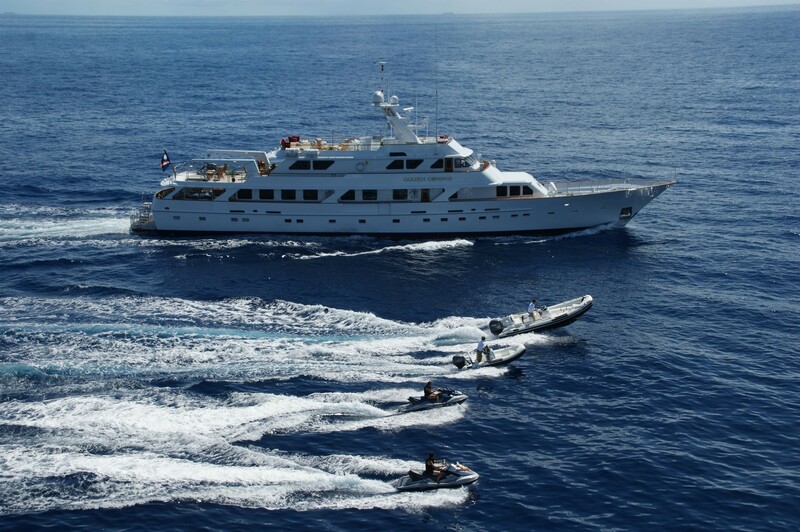 Communications onboard include Satcom, Fleet 77, Fax, VHF, Wireless internet. 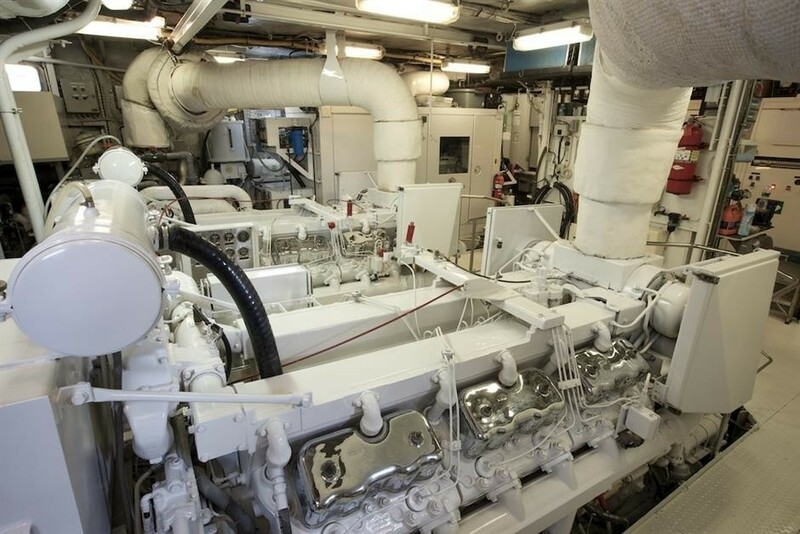 Audio Visual Equipment and Deck Facilities include a centralized movie, music and photo storage and distribution system by Escient. 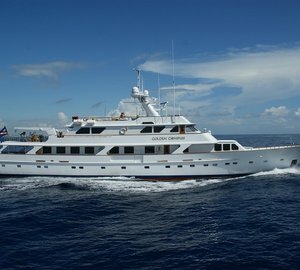 This system is loaded with 250 current video titles and 1,000 songs, all region TV’s for global travel, all region DVD players for global travel, Apple iPod docks (over 12 throughout the vessel), Customized but easy to use remote controls, Global Satellite TV wired to each room, a Marantz 7.1 receiver systems in all of the main entertaining areas, the master stateroom, and the VIP stateroom. 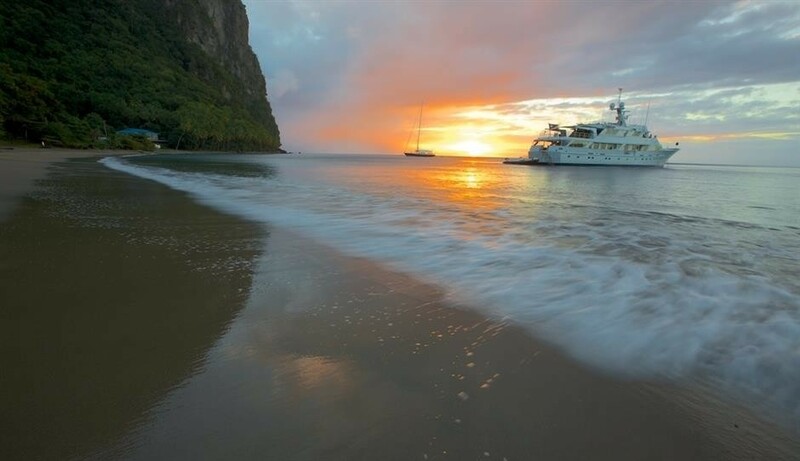 Advanced ships network have been installed providing access to the internet through wireless access points located throughout the boat. The latest global high speed internet system was recently installed.